Be still, our hearts. The production-spec 2017 Honda Civic Type R is finally here, with a turbocharged engine, manual transmission, enormous rear wing, and three exhaust pipes straight out the center of its rear end. Honda is showing the road-ready Civic Type R at the Geneva Motor Show this week, before global sales kick off in a few months. 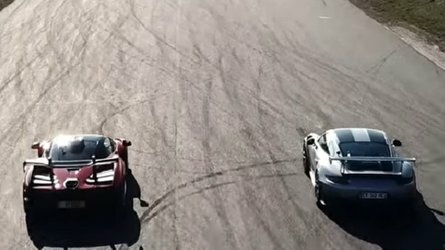 First thing's first: it looks awesome. None of the prototype's aggression was lost in the transition to production, and the hatch looks hot as hell, in all its flared-out, red-accented glory. LED lights are found at all four corners, as are lightweight, 20-inch wheels, wrapped in 245/30-series ContiSportContact tires. 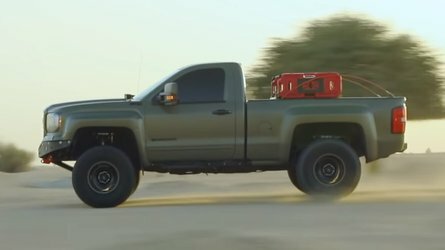 Power comes from a turbocharged, 2.0-liter, four-cylinder engine, mated exclusively to a short-throw, six-speed manual transmission with active rev matching. 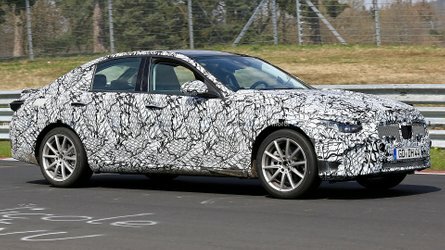 Here in the U.S., the car is rated at 306 horsepower and 295 pound-feet of torque, though Honda points out that foreign-spec cars will actually carry a 315-hp rating (235 kilowatts, 320 PS) because of "a different, European testing protocol." 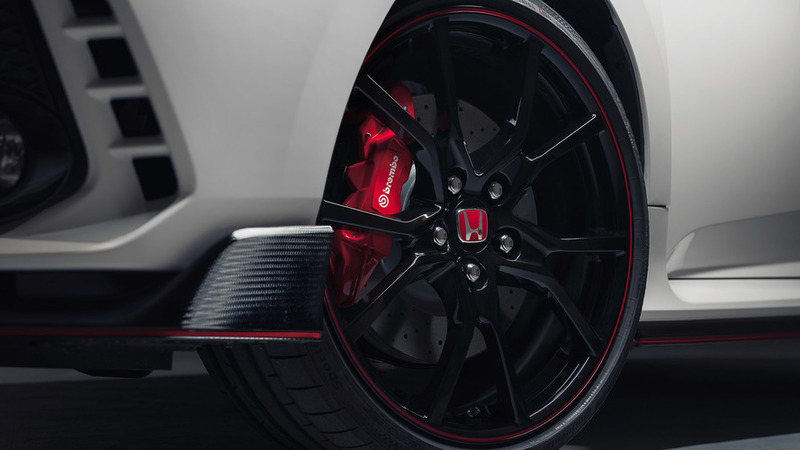 A limited-slip differential will keep the front-wheel-drive Type R in check on the road, as will the dual-axis front suspension and multilink rear setup with adaptive dampers. When it comes time to stop, Brembo front brakes with 13.8-inch rotors will handle the grunt of the power, aided by 12-inch rotors out back. 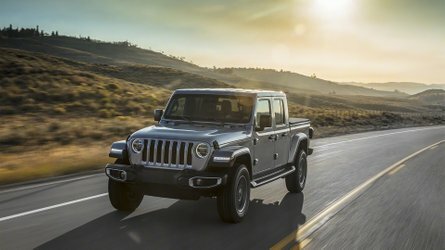 Comfort, Sport, and +R driving modes adjust steering, damping, throttle response, and transmission rev matching, as well as the stability and traction control systems. Honda says the Type R will only come one way, in fully loaded Touring spec. That means you’ll get a seven-inch touchscreen display standard, with navigation, premium audio, and – of course – Apple CarPlay and Android Auto. 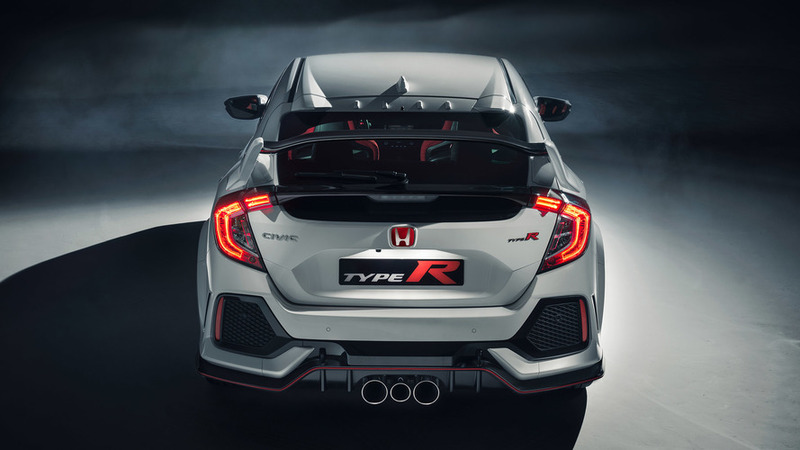 GENEVA, March 6, 2017 – Honda today took the wraps off one of the most anticipated models in its history with the unveiling of the production 2017 Civic Type R at the Geneva Motor Show. The long-awaited Civic Type R, slated to go on sale in the U.S. in late spring with an MSRP in the mid-$30k range, is the first ever Type R-badged Honda to be sold on American soil. 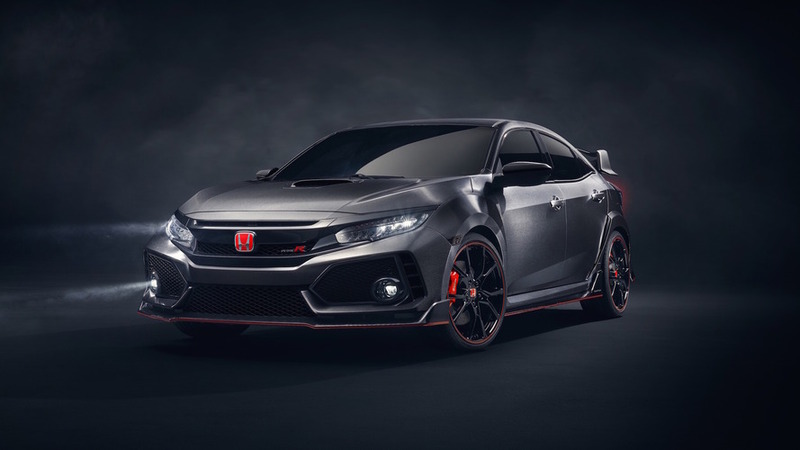 The Type R will feature a high performance 2.0-liter turbocharged powertrain, substantially upgraded body and chassis, and other track-ready, Nürburgring-tuned and tested performance components. The 2017 Civic Type R will make its U.S. debut at the New York International Auto Show on April 12, 2017. The Civic Type R chassis builds on the major upgrades undertaken for the 10th- generation Civic makeover with model-exclusive spring, damper and bushing settings, a new Dual-Axis front suspension setup with aluminum lower arms and steering knuckles for improved at-the-limit cornering and reduced torque steer; a new four-wheel Adaptive Suspension System with three-chamber dampers; a retuned and adaptive dual-pinion electric power steering system with variable gear ratio; and a helical limited-slip front differential. 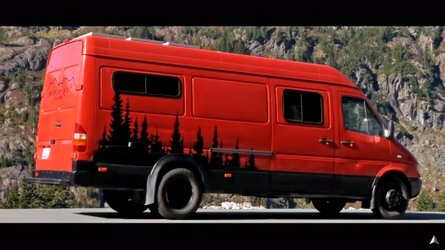 Mounted to the suspension are 20-inch aluminum alloy wheels shod with 245/30R 20 Continental ContiSportContact 6 performance tires. Decisive stopping power comes from Brembo 4-pot aluminum calipers squeezing 350mm (13.8-inch) cross-drilled rotors at the front. The rear braking system features solid 305mm (12-inch) rotors. The Type R’s scalpel-sharp responses are further enhanced by a body more rigid than the substantially improved Civic Hatchback on which it’s based – with a 38 percent increase in torsional rigidity and 45 percent gain in bending rigidity versus the previous Civic Type R – enhancing steering response and cornering stability while mitigating body vibration and cabin noise. The improvements are made possible by the application of structural adhesive throughout the body. Ultra-high strength steel is used for 14 percent of the body structure, and the Type R has an aluminum hood, contributing to a 16 kg (35 lb) reduction in body weight versus the previous Type R, and a 7 kg (15 lb) reduction versus the base 2017 Civic Hatchback. The 2017 Civic Type R is designed to reward the driver in all driving conditions, on the track and on the street, and features three driving modes: Comfort, Sport (default) and +R. The driver selectable modes adjust steering and throttle response, transmission rev- matching, Vehicle Stability Assist (VSA) and the Adaptive Damper System. Utilizing new, three-chamber dampers, individual stroke sensors and three vehicle-G sensors, the new damper system offers a wider range of variability for ride comfort and dynamic handling response. The 2017 Civic Type R will launch this spring in a single, premium-contented Touring trim. A 7-inch Display Audio touchscreen interface with embedded Honda Navigation system has both Apple CarPlayTM and Android AutoTM compatibility; and should the driver ever tire of hearing the Type R growl, a 540-watt, 12-speaker audio system with SiriusXM 2.0, HD Radio and Pandora compatibility is also provided as standard. 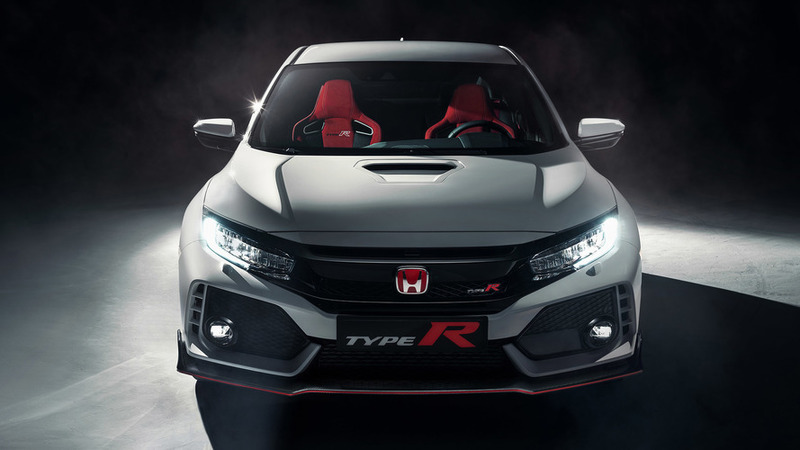 Additional interior Type R features include heavily bolstered sports seats, leather- wrapped steering wheel and shift boot, aluminum shift knob, aluminum sport pedals, red Type R driver’s meter and serialized Type R plate on the center console.